« Can A Union Walk Away With My Contract? MUNICH — As fluent as Valery Gergiev is in Prokofiev, he had precious little to say with a cycle of the symphonies here this month. Fluency meant wise tempos, a feel for the boldness in the scores’ structures, a facility in cuing the two orchestras on duty. It also, in effect, prodded those orchestras — the Munich Philharmonic and the Mariinsky Orchestra — into articulating with dependable precision in the strings, providing expressive, at times miraculous, wind solos, and mustering energy for the colors, contrasts, metrical effects, patent ironies and elevated humor that define this repertory. But in at least five of the symphonies the man waving the toothpick showed no personal engagement with the material at hand, conveyed no sense of exploration or chance or daring. He never pursued an idea to its extreme, stressed unduly some dynamic detail or the possibilities of some internal balance or rhetorical figure, never exploited tonal beauty (or ugliness) for its own sake, or shed any degree of unconventional light on any section of these now familiar pieces. None of that. He played signalman rather than share anything of himself. If the music spoke at all, it was courtesy of the imagination of individual players or in the power of collective discipline, Munich’s or St Petersburg’s. Gergiev’s detachment, and a bizarre kind of genius, allows him to flit undrained from one artistic commitment to the next. In this case he moved through much of Prokofiev’s canon on a single day (Nov. 13*). Symphonies Nos. 3 and 5, 2 and 7, 4 (long version) and 6, anchored concerts at 11 a.m., 2 p.m. and 5 p.m., the afternoon programs being played by the visiting orchestra, with violin concertos of Mozart separating each pairing. The two-movement Second Symphony (1924) came off best, its barely inhibited caustic din traced plainly so that the Variations outflanked the preceding Allegro ben articolato, in sonata form, as the experimenting composer perhaps wished. The Third (1928) and Fifth (1944) were a bit much before lunch. Even so, the Third, drawn from Ognenny angel, sounded pallid with last season’s methodical and heated account under Vladimir Jurowski still in memory. (Jurowski conducted the opera here the same month, to bold effect.) The MPhil played incisively in the Fifth, but countless particulars of the popular score’s middle movements passed blandly by. After a jolly traversal of the Seventh (1952) came the five-intermission day’s one unalloyed pleasure: a slow Prélude à l’après-midi d’un faune (1894), as encore, gingerly sculpted by a for once scoreless Gergiev and divinely played by the Mariinsky’s uncredited flutist. As opener to the last concert, the Fourth Symphony (1947) saw the conductor mostly hands-off, but its jerky bombast registered persuasively and superb woodwind ensemble enhanced the Andante tranquillo movement. 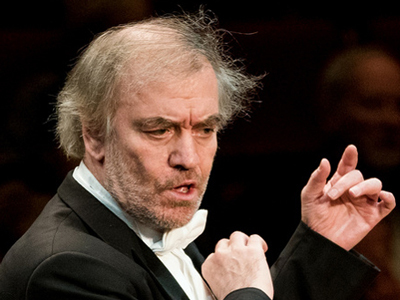 Gergiev provided utilitarian accompaniment in the concertos: No. 1 in B-flat (1773) gaining from the fresh, stylishly poised thoughts of Vilde Frang; No. 4 in D Major (1775) conventionally but tidily contoured by Yu-Chien Tseng; and No. 3 in G (same year) subjected to Alexandra Conunova’s expressive spinning. This last soloist, although a mismatch in Mozart, held the audience in a trance with her fine dynamic control and determined focus on the musical line. Symphony No. 6 (1945) followed Conunova; we had to leave. If the day offered fewer rewards than last year’s corresponding marathon, climax of the MPhil 360° festival, it was better attended, at 70% of capacity, after a marketing push, and the animated Gasteig lobby confirmed the crowd’s immersion in the project. Medici TV equipment inside the hall no doubt captured clearer sound than the real acoustics, which remain at once bright and gallingly centerless. This entry was posted on Wednesday, November 30th, 2016 at 1:17 pm	and is filed under Munich Times. You can follow any responses to this entry through the RSS 2.0 feed. Both comments and pings are currently closed.